English Defence League (EDL) founder Robinson could face being sent back back behind bars if a judge finds him in contempt of court. 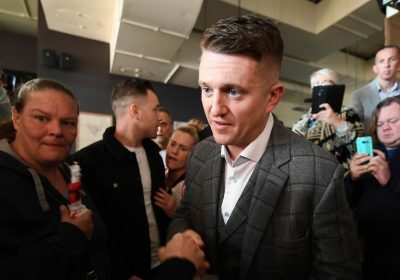 Robinson, 35, had originally been jailed for 13 months after confronting and filming men of Pakistani origin outside a court, where they were on trial for their alleged parts in Britain's biggest grooming gang. At the time there had been court imposed blanket ban on reporting the trial and identifying the accused. Because Robinson filmed people in the trial and then broadcasting the footage on social media he was sent to jail for contempt of court. But he was freed from prison in August after three leading judges quashed the contempt of court finding made at Leeds Crown Court. Last Friday a total of 20 men, predominantly of Pakistani heritage, were found guilty of over 150 offences against 15 girls in Huddersfield across three separate trials. Now a rehearing is to take place over the contempt of court allegations made against Robinson during those trials for streaming video of the defendants. The grooming trial judge, Geoffrey Marson QC, said the footage had risked prejudicing the trial and jeopardised other cases against the gang. But Robinson said he was prepared to go to jail than admit any guilty. According to the Times, he told German website PI News: "I sacked my solicitors because they tried to broker a deal where I apologise and I admit guilt, and then if I do that then I go home. “And I said, I'm never going to do that. "I'd rather go to jail for the next 25 years than accept guilt for telling the truth." Former assistants to Robinson claimed he scooped a "massive payday" when he was jailed for contempt in May after he allegedly earned hundreds of thousands of pounds in donations. A return to prison, it is claimed in the Times, would generate more money and invaluable publicity for Robinson. He was set to appear in court later today. A major police operation is being put in place around the Old Bailey amid fears of public disorder at a hearing. More than 1,000 of the far-right supporters say they will attend a demo outside the London court during a re-hearing over alleged contempt of court.